Q : Were you with the Colonel when you found out Elvis passed away? In this interview, Weintraub places the call from Graceland during the time the paramedics were onsite, which was 2:33pm – 2:47pm, a 14-minute window. He also states that Joe Esposito called first, then Arledge’s call came in (on a second phone line) while Weintraub was on the phone with Esposito. However, in his 2010 memoir, “When I Stop Talking, You’ll Know I’m Dead,” Weintraub places Arledge’s call first. 2. Weintraub states that Arledge’s “people” had picked up the 911 call on a police scanner in Memphis, but in 1977 there was no 911 emergency system in place, and from what Esposito and others have claimed, the call was placed for someone “in distress.” How would Arledge have learned that anyone was dead based on this call, before the paramedics had even arrived at Graceland? 3. Further on this point, if the emergency call had been picked up by Arledge’s sources on a police scanner, the alleged wording of the call still would not have given any clue as to the identity of the patient, nor the condition of the patient. From what we’ve been told, Elvis’s name was not used when the emergency call was placed, which would have been standard protocol. How would Arledge’s people have known that the call was placed for Elvis, specifically, if Elvis’s name was not mentioned? 4. In Weintraub’s previous statement, Joe Esposito called him before the paramedics had left Graceland en route to Baptist Memorial Hospital. My analysis, then, was based on the time-frame that the paramedics were in the bathroom attending to Elvis. One key statement was, “they hadn’t taken him away yet,” which presumably means that the body had not yet been removed by the paramedics. This places the call to Weintraub sometime between 2:33pm (when the paramedics arrived) and 2:47pm (when the paramedics departed Graceland for BMH). 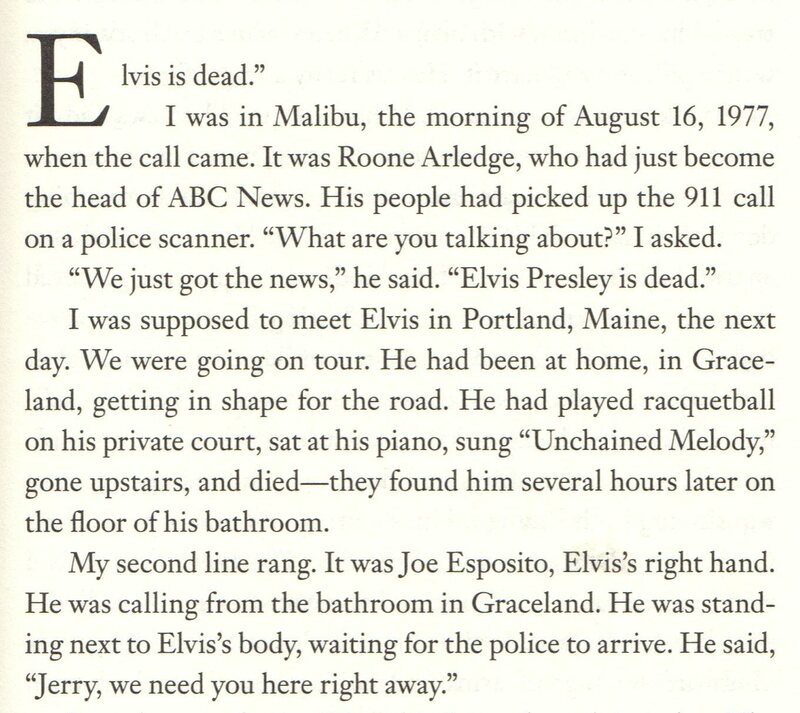 However, in his book, Weintraub states that Esposito called when Elvis’s body still was on the bathroom floor, yet before the paramedics had arrived. This narrows the window of time for this call to the period of time when Esposito was “waiting for the police to arrive” (the EMTs, actually), which was a mere 3 minutes (from the time of the call to the fire station at 2:30pm to the time the ambulance arrived at 2:33pm). 5. Why has Joe Esposito never, to my knowledge, mentioned this call, and why was this call placed at this time, in the middle of what we have been told was a life-and-death crisis? 6. If this call was placed while Esposito was literally standing next to Elvis’s body, why has no one ever said anything about this call, considering that the upstairs suite and bathroom began filling up with people as word got around the Graceland property/mansion that Elvis had been discovered in some sort of distress? From what we’ve been told, several people have stated that CPR was being administered to Elvis, and that Joe Esposito was one of the people working on Elvis before the paramedics arrived. But in Weintraub’s account, Esposito was not involved in the resuscitation efforts for at least several minutes after the 2:30pm emergency call, and had, by that time, determined that Elvis was dead. Again, why has not one person who was in the bathroom at this critical time period mentioned this alleged phone call? Or, if the phone call did not take place, why would Jerry Weintraub, a man of considerable credibility in the entertainment industry with no reason to lie, state unequivocally that the call was placed? As I stated previously, the content of the emergency call is a key issue here, since Esposito would not have identified the person’s identity over the phone, and even the people who are familiar with the content of the call have said the emergency assistance was needed for an adult male in respiratory distress. There was no mention of Elvis, and the people who knew the address assumed the person in question was Vernon Presley. 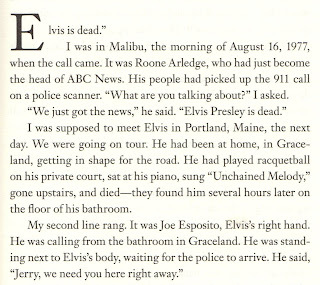 So, if there was no specific mention of Elvis on the call, how did Roone Arledge know within THREE minutes of the call that Elvis was dead? He would have had no access to such information at that time, neither the name of the person nor the condition of the person.